Adam Carolla has an excellent car collection. It’s not as massive as Jay Leno’s but it’s finely cultivated with the objects of desire that appeal to the man who owns the keys to it all. Carolla is a car guy through and through, and most know about his love affair with all things Datsun and Paul Newman. In fact, your author caught site of Carolla running a Datsun up the hill at the most recent Goodwood Festival of Speed. You might not be aware that Adam also has a thing for impossibly gorgeous classic Lamborghinis. That collection, however, is about to be culled. I mentioned that Carolla loves Paul Newman, and it’s that love for the famed actor and racing car driver that leads us to the Lamborghini collection in question. You see, at August’s 2016 Monterey Car Week, Adam wound up being the top bidder on a 1979 Porsche 935. It sold for a sky high $4,840,000. Paul Newman actually raced in this very Porsche, so it’s not a total shock here that Adam was serious about adding it to his stable. To make room, and free up some cash, for that purchase, it seems that five of Adam’s Lamborghinis are hitting the chopping block. This is some list, and it’s sure to fetch a boatload of cash. The blue 1969 Lamborghini Miura P400S. It’s finished in a perfectly outstanding orange paint scheme with a black interior, and it wears just 14,794 miles on its odometer. Next up is another Miura, but this brilliant blue version is from 1970 and has an SV body conversion. 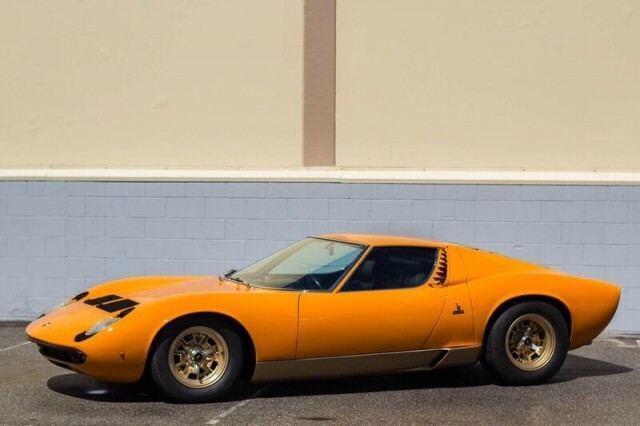 That means it’s essentially somehow more beautiful than a “standard” Miura. This one’s been driven a bit too, as it shows an impressive 41,232 miles on its odometer. Adam is clearly also a fan of the Islero, as he has two of them and they’re both coming along for the sales ride. One is a light blue Islero from 1968 with 62,836 miles on its clock and the other is a dark blue 1969 example with 52,962 miles. Finally, a 350GT finished with a black paint scheme is on the sales list as well. It’s from 1965 and has just 37,177 miles. All together these cars will add up to a nice addition to the bank account that’s been delightfully drained by the aforementioned Porsche. The Islero twins are the most affordable of the bunch. The light blue 1968 car is being sold for $385,000 while the 1969 dark blue example has a price of $350,000. That wonderfully black 350GT needs $800,000 to find a new home. Finally, the Miuras are where the real coin comes into play. Carolla is asking $1.4 million for each one. All the cars appear to be in damn near perfect shape, and each should have no problem finding a new owner.